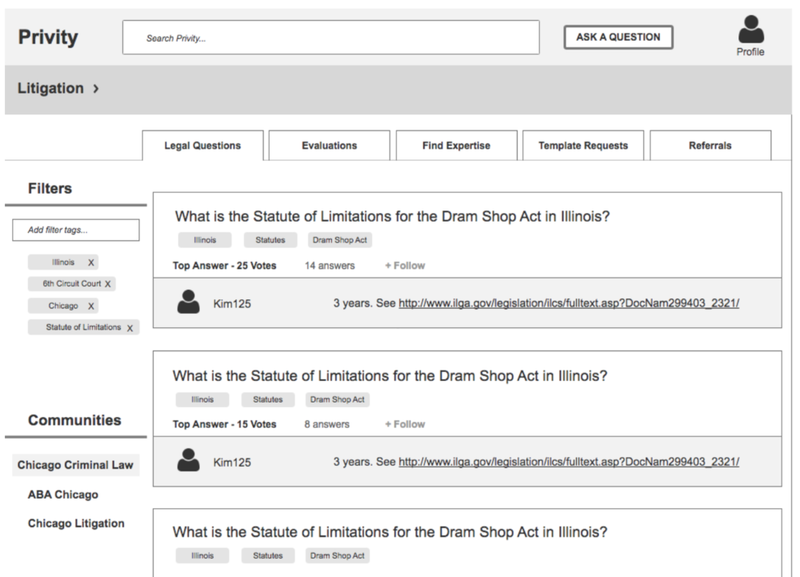 Challenge: To build a time-saving research and collaboration tool for attorneys. 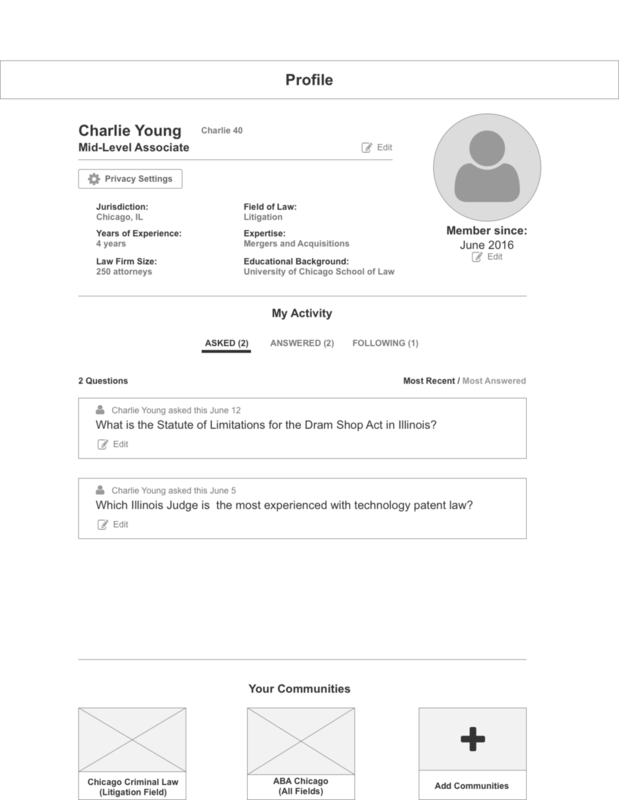 Our DESIGNATION team was faced with building a new product from the ground-up for a company wanting to bring a collaboration-focused online research tool to the law industry. Privity came about from seeing a massive inefficiency in legal research and a lack of communication among new lawyers. If there was a research tool that could save lawyers research time and therefore money, they would jump at the chance to use the product. We were brought on to Privity to conduct initial UX research and to develop a stronger product concept based on our research. We began our process by taking a survey of what it is really like to be a new attorney doing research for their cases in the field. Privity noticed a problem among new associates that they were spending the majority of their time researching and that those things have most likely been researched previously by associates before them. Our process began with research and empathizing with attorneys. We needed to better understand the research methodology and pain points for new law associates. We also needed to identify a way in which these attorneys would expect information to be organized within a resource like Privity. We wanted to gauge how comfortable attorneys are with asking each other for advice while conducting research and in turn, how comfortable attorneys are with providing advice to other attorneys within and outside of their own firms. We also needed to determine if this concept would be validated by the attorneys we spoke to. We developed a plan to speak with as many attorneys as possible in the short timeframe we were given. We initially interviewed ten attorneys from varying sized firms that represented at least five different types of law. The majority of our interviewees were new associates, but we also spoke to mid- and senior-level attorneys as well. After completing our extensive interviews we created two distinct personas that would allow our clients to see the key differences in potential users and how these insights and challenges would influence their decisions. The “Large Firm Associate” is concerned with becoming the top associate in his class and works in an extremely competitive and non-collaborative environment. The “In-House or Small Firm Associate” works in a much more collaborative environment, but has significantly fewer resources to consult because of their expense. While diagramming the data from these interviews we found notable insights and challenges that would help us moving forward. Due diligence: Law associates don’t want to appear lazy or incompetent by asking for help finding information that should be relatively easy for them to find them to find. Associates will typically do on average about two hours of research before reaching out to a colleague out of respect and self preservation. Distinct search processes: Associates typically conduct two distinct types of searches. Once search is for information with easily verifiable answers such as citations, forms, precedent, etc. The second search are requests for professional services, referrals or information on specific individuals. These two types of searches have distinctly different mental models and should likely be handled differently by Privity. Timeliness: Legal precedent is constantly evolving therefore, associates are not only looking for relevant information, but also the most recent. To deliver maximum value, the information found within Privity must reflect this dynamic. Along with our key insights we identified three significant challenges that we need Privity to address. Time is of the essence: Interview subjects reported an unwillingness to contribute to a platform like Privity if it would take more than five minutes, which means we need to be certain that it’s a quick process for both finding and contributing information. Anonymity: Many attorneys noted that sharing legal advice or information can pose a great personal and professional risk. Therefore, before sharing documents, attorneys will need to spend time redacting confidential information, potentially creating a significant barrier for engagement. Privity will need to strongly consider the privacy needs of our users. Reliability and Liability: Our interviewees were concerned about the verification of the answers. How will users verify the accuracy of the answers provided on the platform? Will there be recourse if someone provides an inaccurate answer, and who is liable? Privity needs to be sensitive and proactive about content monitoring and verification. As we moved through our interviews, we spoke with the attorneys about what tools they were currently using for research and analyzed the features that worked and what they might be missing. To be certain that Privity will set itself apart from what is currently being offered to attorneys, we surveyed the key features our main competitors are using. It was easy to see that Foxwordy was going to be something we really looked at closely, but also Quora and Stack Overflow might give us some interesting insight on how to build Privity. We also looked at successful online communities outside of the legal field to see what it takes to build a highly valued online forum. Medical forums deal with anonymity and confidentiality by implementing a verification process to access the platform. We could duplicate this with Privity by requiring license numbers from registrants. An online diet and exercise forum called DietBet increased user participation by adding anonymity and creating a safe space to share trials and tribulations of losing weight. DuoLingo’s online community focuses on making it easy for members to create content and easy for them to moderate and provide feedback on that content, which is something our users have already expressed an interest in. After looking at our initial research and surveying our competitors, we developed a problem statement that we would need to answer when designing Privity. Law associates need an efficient, reliable and anonymous way to find resources and answers so that they spend less time researching and more time doing meaningful work. Before beginning the process of creating on our prototype concepts, we designed a survey to reach more attorneys and gain additional insight into attorneys habits and needs. With the survey we found associates spend 26% of their time researching and estimate that 35% of that research could be eliminated by efficiently sharing information with colleagues and friends. This further proves that Privity could really make a difference in the lives of attorneys, which is the validation our client was hoping for. From the survey we also found out that only 33% of associates currently belong to legal professional groups in which they feel comfortable asking questions and exchanging information. This is another opportunity for Privity to create additional communities that these associates would feel comfortable sharing information with. As we began our ideation and concept creation phase we built a simple model to show how attorneys currently conduct their research. This is a chart helped us and our client identify opportunities for Privity to improve the research process for attorneys. While keeping the task flow in mind, when we began designing our Privity concepts. We began with a web app because the attorneys we spoke with conduct their research on their desktops or laptops. There may be an opportunity in the future to develop a mobile platform, however we decided the initial product should be a website. Using our problem statement and design principles, we initially came up with two divergent solutions to test as paper prototypes with attorneys. In designing our first prototype, here are the concept features that we wanted to test with users: information architecture and question categories, having a featured question on each page, the idea of reputation points for the user and the way in which its members vote, answer and view each question. Users didn’t want the added task of rating quality of the questions on Privity. Users had difficulty understanding points and reputation system. 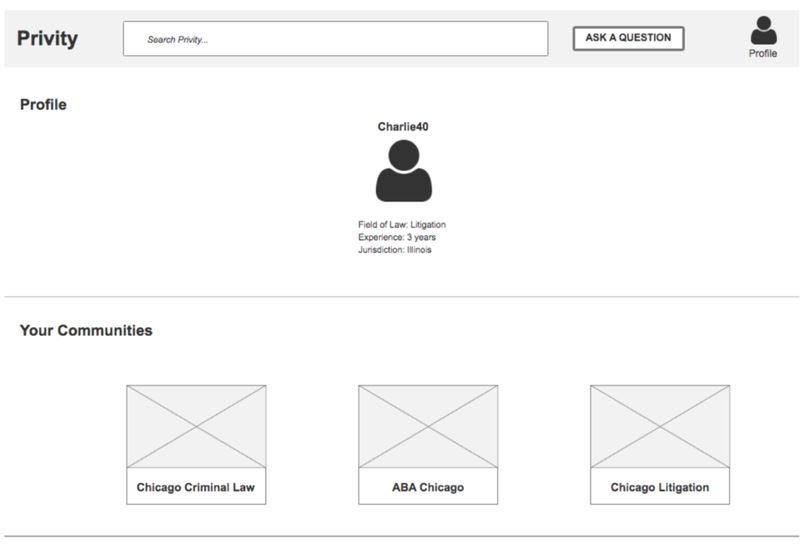 Our second paper prototype focused on a simple tab navigation for question categories, the ability to “upvote” or “downvote” questions and answers, personalization of the home screen, adding professional user information for users who answer questions, and related questions listed to further aid in research. Users would not create their own tags when asking or answering questions. This is an opportunity to integrate auto-tagging into the system! Users want to be able to upvote/downvote answers, but don’t see the need to upvote/downvote question. The terminology for separating Privity into sections (‘Vetting info’, ‘Find expert’ + ‘Referrals’) is comprehensive for some users, but not for all. According to our users, it’s going to be vital to the success of Privity that we protect the liability of our users. We adjusted the categories by which people can search for information based on the feedback we had received. 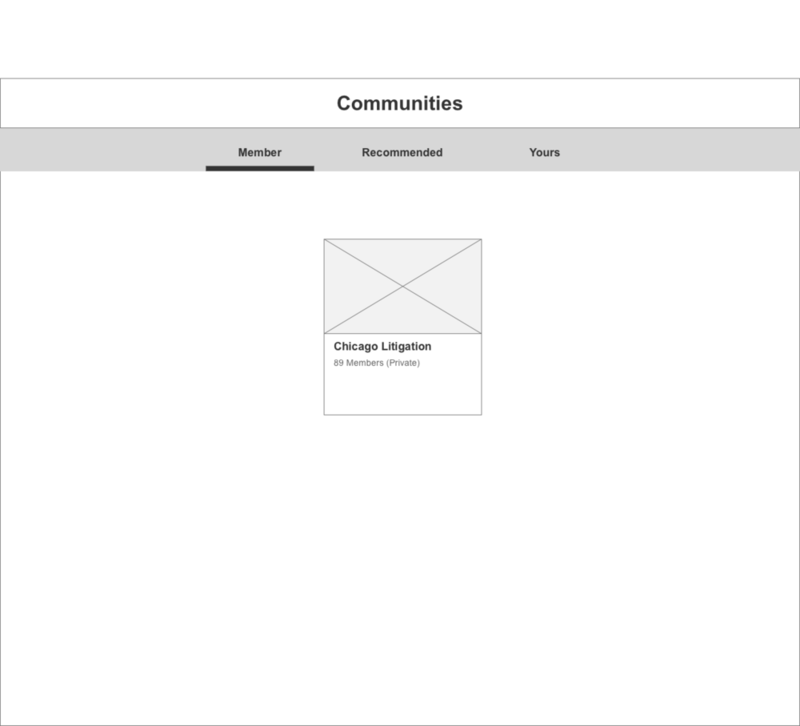 We added a communities section similar to Google+ groups to see if it resonated with users. We adjusted the search bar so that the user can search Privity or ask a question directly from the top, similar to Quora. We decided that each question will always be paired with the to see “top answer” so that the user doesn’t have to click on the question if they are only doing quick research. Our users suggested that the upvote and downvotes should only apply for the answers and not the questions. We tested that with this prototype. We added a bar to the right side for related questions in hopes that this will help the user find exactly what they are looking for on our site. Size of Reach: Users expressed more comfort in asking questions and sharing information within smaller groups. Focused Communities: Users want a more explicit way to send questions directly to particular affinity groups. Transparency: Multiple users expressed that they trusted the answers more because of the additional profile information. Add size of firm and specialty within field of law for more trust. Terminology: We will need to work on classifying the RFI information within our tab navigation. The categories were not clear to all users. Most did not know what “Evaluations” meant or what the difference is between “Find Expertise” and “Referrals”. There are a number of things that we would like to have tested that our three week timeframe didn’t allow for. Moving forward we suggested to our client that they further test intuitive terminology for the site. Users need to be able to confidently find the information they expect based on the terminology used to organize content. Another aspect that we didn’t get to test was our final content organization Is the separation of the main feed and community feed intuitive for the user? We worked hard to create platform that could be trusted to make users feel safe and trust the platform. We would also like to further test if the new personal and professional information specifications assuage users’ skepticisms before designing a high fidelity user interface for Privity. In my first UX project with a start-up company, I learned so much about how extensive research can really influence creating a product. Our research throughout the process affected each decision we made for the user. It was fascinating to learn so much about the law industry and how important research is to each attorney's process. Research really is one of the most important aspects of their jobs. From this project I have a new appreciation for power of paper prototyping, the value that a survey can bring to concept validation and the importance of iterating upon a design.